08/11/13 -- Soycomplex: It was always going to be a choppy day, with the USDA releasing it's first world supply and demand numbers for two months, and so it proved. Front month Nov 13 beans traded from 4 cents lower to almost 28 cents higher, and closed almost at the session highs. The USDA gave us 2013 US soybean yields of 43 bu/acre, towards the top end of the range of expectations and above the average trade guess of 42.4 bu/acre. Production was estimated at 3.26 billion bushels, which was also towards the upper end of the range of estimates and above the average guess of 3.22 billion. Harvested acres were however lowered from the USDA's September estimate of 76.378 million, and the average trade guess of 75.93 million, to 75.69 million. US 2013/14 ending stocks came in slightly below trade forecasts of 172 million bushels at 170 million. World old crop ending stocks were trimmed from 61.55 MMT to 60.11 MMT, with new crop ending stocks cut from 71.54 MMT to 70.23 MMT. It was these reductions in stocks that was given credit for being behind today's rally. There were no changes in production for Brazil (88 MMT), Argentina (53.5 MMT) or Paraguay (9 MMT) from September. Brazil's 2013/14 exports were raised 1.5 MMT to 44 MMT, but Argentina's were cut by 3 MMT to 9.7 MMT. A near 3 MMT increase in US production was just about matched by a 820 TMT rise in the US crush and an extra 2.1 MMT worth of exports. US meal exports were raised from 8.6 MMT to 9.3 MMT. China's soybean imports in 2013/14 were left unchanged at 69 MMT. Separately, Chinese customs data revealed October soybean imports of 4.19 MMT, down 11% on September, although up 4% versus a year previously. Jan/Oct 13 imports now stand at 49.94 MMT, a 3.3% rise year-on-year. The USDA's estimate for 2013/14 imports of 69 MMT represents an increase in Chinese imports of over 15% season-on-season, so that clearly looks somewhat ambitious. Conab forecast Brazil's 2013/14 soybean crop at a record 87.9-90.2 MMT versus 81.5 MMT in 2012/13. The Buenos Aires Grain Exchange said that Argentine farmers will probably sow more than the 20.2 million hectares of soybeans that they currently have factored in. Plantings are so far around 11% done, they added. Nov 13 Soybeans closed at $13.06, up 27 1/4 cents; Jan 14 Soybeans closed at $12.96, up 29 1/2 cents; Dec 13 Soybean Meal closed at $422.30, up $18.50; Dec 13 Soybean Oil closed at 40.24, down 50 points. For the week Nov 13 beans were up 40 cents, with meal rising $27.40 and oil dropping 135 points. Corn: Corn also traded both sides, from 5 cents lower to 9 cents higher, for once breaking out of the narrow trading range and steady grind lower that we've seen for most of the past two weeks heading into this report. The USDA placed 2013 US corn yields at 160.4 bu/acre, versus a range of guesses of 155.6-163.3 bu/acre, and the estimate of 155.3 bu/acre used in September and the average pre-report forecast of 158.9 bu/acre. They place production marginally below 14 billion bushels (the estimated range was 13.42-14.37 billion) versus their September estimate of 13.84 billion, and up sharply on 10.78 billion a year ago. Harvested acres were pegged at 87.23 million versus an average trade estimate of 88.09 million. They put 2013/14 US ending stocks at 1.89 billion bushels compared to the average trade guess of 2.03 billion. As with soybeans, it was these lower than anticipated ending stocks that were ultimately given the credit for pulling the market higher at the close. In the end, the market brushed aside the news that world corn ending stocks were forecast almost 13 MMT higher this month than in September at 164.33 MMT, and almost 30 MMT more than a year previously. Brazil's corn crop was trimmed 2 MMT to 70 MMT, Argentina's was left unchanged at 26 MMT. Mexico's corn imports were raised 2.5 MMT to 10.5 MMT. China's were left unchanged at 7 MMT. Separately, Conab estimated Brazil's 2013/14 total corn crop far higher than the USDA's 70 MMT at 78.5-79.2 MMT compared to a previous estimate of 78.4-79.6 MMT and 81.0 MMT in 2012/13. They estimated Brazil's 2013/14 corn exports at 18 MMT versus 21 MMT in 2012/13 and the USDA's forecast of 20 MMT. The Buenos Aires Grain Exchanged said that corn plantings in Argentina are 39% complete. Now that Brazilian corn has been quarantine approved for export to China, the Brazilian Ag Minister wasted no time in saying that he wanted his country to export 10 MMT to the Chinese. As ever, there are reports that all is not well with the Chinese corn crop, and that production there this year could fall well short of the USDA's re-affirmed 211 MMT estimate of today. Dec 13 Corn closed at $4.26 3/4, up 6 1/4 cents; Mar 14 Corn closed at $4.38 1/2, up 7 cents. For the week Dec 13 corn was 1/2 cent lower despite today's mini rally. Wheat: Wheat ultimately finished lower on all three exchanges, but also featured choppy two-sided trade. Front month CBOT wheat had a daily trading range of almost 15 cents, whilst in Minneapolis it was almost 25 cents. The USDA numbers were seen as negative, although as with corn and soybeans there was something for both the bull and the bear camp to cling on to. The main bearish surprise came from the USDA forecasting 2013/14 US all wheat ending stocks of 565 million bushels. That was up slightly on September's 561 million, whilst the average trade guess was for a cut to 519 million. There was also a rise of 2.2 MMT to world 2013/14 ending stocks to almost 178.5 MMT, contrary to trade expectations of a small cut to 175.9 MMT. US 2013/14 all wheat production was raised from 57.54 MMT to 57.96 MMT. Argentina's wheat crop was only trimmed by 1 MMT to 11 MMT, the trade was probably expecting a bit more of a cut. Canada's crop was raised from 31.5 MMT to 33.2 MMT, maybe a little higher than expected. The bottom line is that there is no shortage of wheat on a global level, and that matched with a record world corn crop the USDA sees demand for it waning and stocks rising. The USDA estimated Brazil's wheat import requirement at 7.7 MMT. Conab today suggested that imports would be 1 MMT lower than that. China's wheat import requirement was dropped 1 MMT from September to 8.5 MMT, and India's exports were raised 1 MMT to 6.5 MMT. Russia and Kazakhstan both had their wheat production and export potential cut. Australia's wheat crop was left unchanged at 25.5 MMT, around the middle of the range of various private estimates. Stiff competition for US wheat on the world export stage is seen coming from Europe. The USDA raised EU wheat exports from the 23 MMT forecast in September to a record 24 MMT today (and versus 22.6 MMT in 2012/13). The EU granted export licenses for 461 TMT of soft wheat this week, which pushed cumulative sales to 9.4 MMT compared with 5.7 MMT last year at this time. This week's weakening of the euro, following the ECB's decision to cut interest rates in the eurozone, should keep EU wheat competitive, especially at a time when Black Sea exports are dropping off. Dec 13 CBOT Wheat closed at $6.49 3/4, down 3 1/4 cents; Dec 13 KCBT Wheat closed at $7.08 1/2, down 4 cents; Dec 13 MGEX Wheat closed at $7.08, down 1 1/2 cents. For the week CBOT wheat closed 18 cents lower, with Kansas down 25 cents and Minneapolis 12 1/2 cents easier. 08/11/13 -- EU grains closed flat to lower, with Nov 13 London wheat ending GBP1.00/tonne easier at GBP163.25/tonne, whilst Jan 14 was down GBP0.40/tonne at GBP163.50/tonne. Nov 13 Paris milling wheat settled EUR1.50/tonne easier to close at EUR201.50/tonne. Feb 14 Paris rapeseed fell EUR1.00/tonne to EUR376.75/tonne, whilst Jan 14 Paris corn closed EUR0.75/tonne lower at EUR173.50/tonne. For the week London wheat was down GBP1.25/tonne and Paris wheat fell EUR6.25/tonne despite the weaker euro and Algeria picking up 650 TMT of optional origin milling wheat (said to most likely be French) for Jan/Feb shipment today. Russia has now planted winter grains on 14.3 million hectares, 87.5% of the original target. This compares to 15.6 million ha this time a year ago. 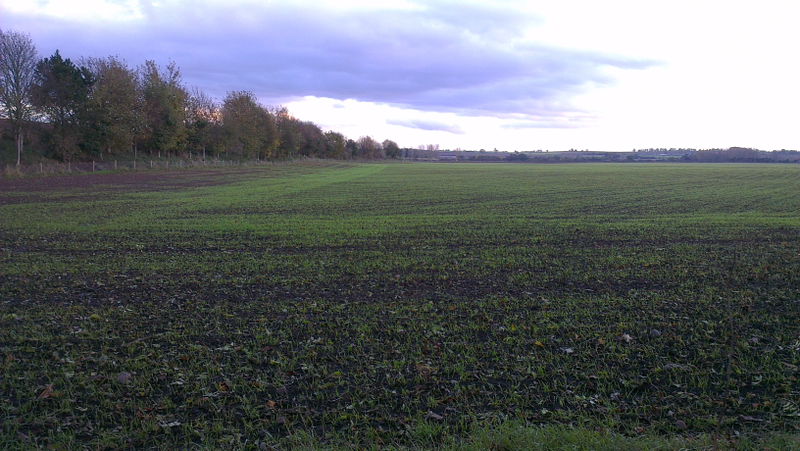 Incidentally, out of a final winter planted area of 15.8 million in 2012, only 14.7 million made it through to spring. The Ukraine Ag Minister said that he now expects around 400,000 hectares of the originally planned winter grains area to go unplanted. It was feared that this figure was going to be in the region of 1.2-1.3 million ha a month or so ago, but warm and dry conditions since have allowed much of this lost ground to be made up. He said that he expects the 2014 corn area to increase by around 500,000 ha to 5.5 million ha, with a small downwards revision in area from sunflower making up the difference. That potentially means a 10% rise in corn plantings in 2014. You will recall that this year's crop is expected to be a record in the region of 28-29 MMT. In what many were calling the most important USDA report for years, Washington cut their forecast for world wheat production in 2013/14 by around 2.5 MMT to 706.4 MMT, although that's still a record crop. Despite the reduction, ending stocks were raised a similar amount, by 2.2 MMT to 178.5 MMT. Essentially they are saying that the increased corn supply for 2013/14 will eat into demand for wheat, raising ending stocks. Argentina's wheat crop this year was trimmed from 12 MMT to 11 MMT, Australia's was left unchanged at 25.5 MMT and Canada's increased from 31.5 MMT to 33.2 MMT. Europe's wheat crop was raised some 440 TMT and ending stocks here increased by almost 1 MMT to 12.1 MMT despite exports being pegged at a record 24 MMT versus 23 MMT in September. China's wheat import needs were cut by 1 MMT to 8.5 MMT, with Brazil's left unchanged at 7.7 MMT. India was forecast to export 1 MMT more wheat than in September at 6.5 MMT. Wheat production in Russia this year was trimmed from 54 MMT to 51.5 MMT, with Kazakhstan's crop reduced from 17 MMT to 15.5 MMT. The export potential of both was also pared back. Russia's wheat exports are now seen at 16 MMT versus 17 MMT previously, and Kazakhstan's were cut from 9.5 MMT to 8 MMT. In other news, FranceAgriMer said that winter wheat planting there was 81% complete as of Nov 4 versus 70% a week previously and 75% a year ago. 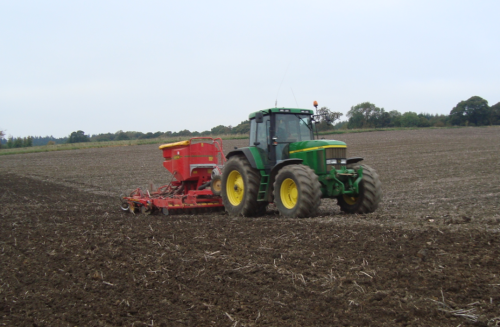 They said that 96% of the winter barley crop was sown versus 87% last week and 92% a year ago. The French corn harvest was said to be 50% done versus 35% a week ago and 77% complete this time last year. They added that 88% of the French winter barley crop was rated as good/very good versus 76% a year ago. Corn good/very good was trimmed one point from last week to 57%, and much lower than 69% a year ago. US government offices are closed on Monday due to the Veteran's Day holiday, which means that the usual crop progress report comes out Tuesday night (London time) and the weekly export sales are put back to Friday afternoon. Nov 13 Paris wheat expires on Monday, and Nov 13 CBOT soybeans go off the board on Thursday. Nov 13 London wheat is with us a little while longer yet, that doesn't expire until a week on Friday (Nov 22). 07/11/13 -- Soycomplex: Soybeans closed mixed, firmer on the nears and weaker on the forwards, ahead of tomorrow's important USDA report. That is expected to give us a US 2013 soybean yield of 42.407 bu/acre, from within a range of estimates of 41.5-43.3 bu/acre. The USDA's September estimate was 41.2 bu/acre and 2012 final yields were 39.6 bu/acre. For production the average trade guess is 3.221 billion bushels, from within a range of estimates of 3.137-3.298 billion. The USDA September estimate was 3.149 billion and the 2012 crop was 3.015 billion. Bean harvested acres are estimated at 75.928 million, from within a range of estimates of 74.7–76.98 million and the USDA's September estimate of 76.378 million. US 2013/14 soybean ending stocks are forecast at 172 million bushels, from within a range of estimates of 145-240 million and the USDA's September estimate of 150 million. In other news, weekly soybean export sales came in at 1,018,400 MT for 2013/14 along with a further 18,700 MT for 2014/15. Sales of only 113,500 MT were needed to hit the USDA target for the season. Weekly shipments were very strong at 2,159,800 MT, and were primarily to China (1,690,900 MT). Total net shipments plus outstanding sales now stand at 89% of the current USDA forecast for the season versus around 60% normally at this relatively early stage. Separately, private exporters reported the sale of 250 TMT of US soybeans to China under the daily reporting system. 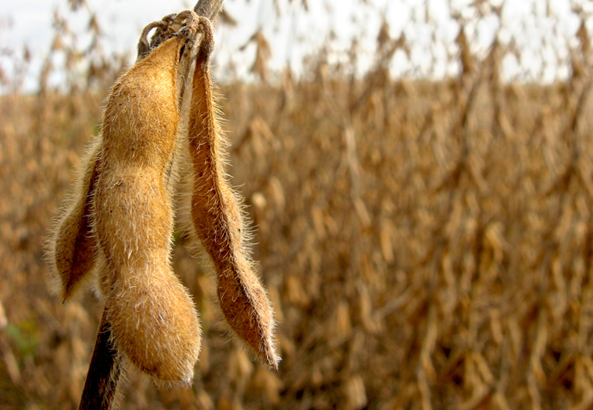 Nov 13 Soybeans closed at $12.78 3/4, up 15 3/4 cents; Jan 14 Soybeans closed at $12.66 1/2, up 11 1/2 cents; Dec 13 Soybean Meal closed at $403.80, up $7.00; Dec 13 Soybean Oil closed at 40.74, down 40 points. Corn: Corn was narrowly mixed, but still managed to post a new lowest close in more than 3 years on front month Dec 13. The daily trading range was less than 5 cents. The market is expecting a bearish report from the USDA tomorrow. With funds heavily over-sold the reaction could be violent to the upside IF it doesn't get it. US 2013 corn yields are seen averaging 158.933 bu/acre, from within a range of estimates of 155.6-163.3 bu/acre. The USDA's September estimate was 155.3 bu/acre and 2012 final yields were only 123.4 bu/acre. Corn production is estimated at an average of 14.003 billion bushels, from within a wide range of estimates of 13.421–14.367 billion. The USDA's September estimate was 13.843 billion bushels and 2012 final production was 10.78 billion. For corn harvested acres the average trade estimate is 88.0947 million, from within a range of estimates of 86.9-89.135 million and the USDA September estimate of 89.135 million. US 2013/14 corn ending stocks are seen rising to an average estimate of 2.029 billion bushels, from a range of estimates of 1.799-2.292 billion and the USDA September estimate of 1.855 billion. Weekly export sales for corn were better than expected at 1,718,600 MT. This week's exports were 710,200 MT. China are said to have approved Brazilian corn for import, giving US corn a bit more competition there. There's also some talk that the EPA could release revised (lower) ethanol production mandates tomorrow, which could add to the volatility. Dec 13 Corn closed at $4.20 1/2, down 3/4 cent; Mar 14 Corn closed at $4.31 1/2, unchanged. Wheat: Wheat closed with fairly modest losses, with the Kansas market displaying the most weakness. The expectation for a bearish USDA report on corn is keeping a lid on any attempts at a wheat rally. For wheat, tomorrow's report is expecting a fairly large drop in US 2013/14 carryout, from 561 million bushels in September to 519 million this time round. This is largely due to the "new" demand being displayed on an almost weekly basis from Brazil. Weekly export sales for wheat were ho-hum at 416,800 MT for 2013/14 plus 11,000 MT for 2014/15, and included only 27,700 MT to South America's largest wheat buyer. Actual shipments of 312,000 MT included 85,200 MT to Brazil. The FAO cut their forecast for the Argentine wheat crop from 9.5 MMT to just 8.8 MMT, the same level given by the Argentine Ministry a couple of weeks ago that was subsequently "pulled" as being erroneous. To add to the southern hemisphere confusion the USDA's FAS in Canberra put Australia's wheat crop at only 23.5 MMT, citing weather problems in eastern states, despite other trade estimates being in the 25.0-28.0 MMT range. The USDA themselves went for 25.5 MMT in September. Canada's wheat crop could be increased from the 31.5 MMT that the USDA forecast in September to around 33 MMT. Meanwhile a CNGOIC senior economist says that China will import "only" 5 MMT of wheat in 2013. The USDA has pegged imports at 9.5 MMT for the 2013/14 season. They have certainly gone a bit quiet lately. Then we also have the question of India to be answered. What will they export in 2013/14 now that they've lowered their price aspirations? Dec 13 CBOT Wheat closed at $6.53, down 1/4 cent; Dec 13 KCBT Wheat closed at $7.12 1/2, down 4 cents; Dec 13 MGEX Wheat closed at $7.09 1/2, down 2 3/4 cents. 07/11/13 -- EU grains closed mixed, but mostly firmer, with Nov 13 London wheat ending up GBP0.75/tonne at GBP164.25/tonne, Nov 13 Paris wheat finishing EUR1.00/tonne higher at EUR203.00/tonne, Nov 13 Paris corn EUR2.75/tonne firmer at EUR174.25/tonne, whilst Feb 14 Paris rapeseed rose EUR3.25/tonne to close at EUR377.25/tonne. The ECB surprised the market by lowering interest rates in the Eurozone to an all-time low, which boosted prices in Paris as the pound rose to 1.20 versus the euro. Russia's grain harvest is almost 93% done at 91.6 MMT, including 53.7 MMT of wheat off 97% of the planned area. They've also now harvested 15.8 MMT of barley (off 92% of the expected area) and 7.2 MMT of corn (off 55% of plan). 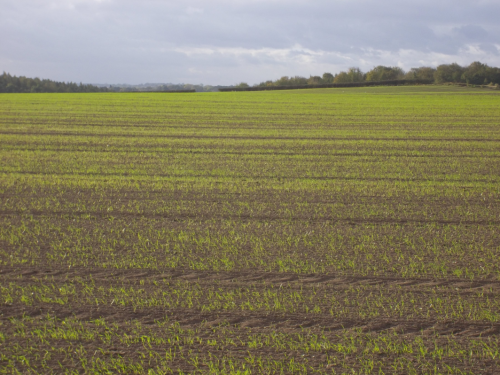 Winter plantings for the 2014 harvest have now been complete on 14.2 million hectares, 87% of original expectations, and 1.4 million less than at this time a year ago. The leading Russian winter grains producing state of Krasnodar has 1.45 million hectares of it's crop in the ground (96% of plan), of which 1.3 million ha is wheat. Ukraine has winter wheat planted on 6.2 million hectares versus 6.6 million a year ago. APK Inform said that Ukraine only exported 669.4 TMT of grains in the week through to Nov 3, a 22% decline on 861.7 TMT a week previously. Wheat shipments fell from 313.2 TMT to 125.7 TMT, and barley exports from 73.9 TMT to 27.3 TMT. Egypt's GASC only bought one cargo of Romanian wheat in their tender yesterday. This would suggest that the cheaper, quality wheat offers out of Russian and Ukraine may be drying up. The former now appears to have mainly lower grade wheat left on it's hands, whilst the latter may now start to concentrate on exporting it's anticipated 29 MMT record corn crop. Reports suggest that the first large consignment of Black Sea corn of the 2013/14 season has arrived on Teesside to feed the Ensus bioethanol refinery. All eyes are now on the USDA's first World Agricultural Supply and Demand report for two months due tomorrow afternoon. The trade is expecting US all wheat 2013/14 carryout declining to around 519 million bushels from 561 million in September. What the USDA will have to say with regards to Argentine and Australian wheat production this year will also be of interest as other estimates in the market for the former are now universally lower than the USDA's 12 MMT forecast in September. The USDA's FAS yesterday meanwhile cut their forecast for Australia's wheat crop to 23.5 MMT versus the official USDA estimate of 25.5 MMT in September. Canada's wheat output will likely be raised, and what will they have to say with regards to India's export potential? There are quite a few questions there, and consider that this report is likely to be more about corn and soybeans than it is for wheat. 06/11/13 -- Rapemeal prices on the continent are mostly a little lower today. The market feels a little bit "toppy" but that could all change on Friday when the USDA's November WASDE report comes out. 05/11/13 -- Soycomplex: Nov 13 beans finished with their lowest daily close since Aug 16th on harvest pressure and good progress with soybean plantings in South America. Also weather forecasts say that Argentina is due another decent rain event this weekend. Current price levels strongly favour soybean plantings over corn in South America, where a record crop is on the cards in 2014 - if the weather co-operates. Safras e Mercado forecast the total South American soybean crop at 163.037 MMT, up 11.5% versus 146.226 MMT a year ago. That includes a record crop in both Brazil and Argentina, with production in the former at 89.453 MMT versus 82.125 MMT a year ago and Argentina's crop at 57.57 MMT versus 49.1 MMT in 2012/13. They say that as of Nov 1st the Brazilian soybean crop was 44% planted versus 36% normally. They said that Mato Grosso soybean planting is 72% complete versus 63% a year ago. Brazil’s Trade Minister said that Feb/Oct soybean exports were 42.04 MMT, up 33.8% from a year ago. Nov 13 Soybeans closed at $12.59 1/4, down 4 3/4 cents; Jan 14 Soybeans closed at $12.50 1/4, down 6 1/4 cents; Dec 13 Soybean Meal closed at $392.80, down $4.10; Dec 13 Soybean Oil closed at 41.15, down 10 points. Corn: It was the same old story for corn: grinding lower in narrow trade, setting a new multi-year front month closing low at the finish. Dec 13 corn had just a 3 cents trading range on the day. The trade is bracing itself for a 14 billion bushel crop estimate from the USDA on Friday, but will it get it? Trade estimates for 2013/14 US corn ending stocks are centred around a healthy 2 billion bushels versus only 661 million at the end of 2012/13. The USDA announced 140 TMT of US corn sold to South Korea along with 126 TMT sold to unknown for 2013/14 delivery. Much more will be needed, although forward sales are robust. Cumulative shipments have reached 16.9% of the USDA forecast for the entire marketing year versus 17.7% as the 5-year average for this time of the year. Safras e Mercado said that 77% of the Brazilian summer corn crop is planted versus 63% a year ago. They estimate production of both summer and second crop corn at 77.238 MMT versus 82.070 MMT a year ago. The Brazilian Trade Minister placed Feb/Oct corn exports at 16.223 MMT, up 17.3% from a year ago. Dec 13 Corn closed at $4.25, down 1 1/4 cents; Mar 14 Corn closed at $4.35 1/2, down 1 1/2 cents. Wheat: Wheat closed lower on all three exchanges on ideas that the recent rally may have been overcooked. Pressure also came from corn at new more than 3-year lows and last night's crop ratings from the USDA showing 63% of the nation's winter wheat crop in good/excellent condition, up 2 points on last week and compared to only 39% a year ago. Yesterday's export inspections of only 7.146 million bushels versus the expected 17-21 million added to the bearish sentiment. Inspections need to average 16.5 million bushels each week to reach the USDA projection for the year. Egypt's GASC tendered for wheat for Dec 1-10 delivery, with the results expected tomorrow. Although it's unlikely that US wheat will feature, French wheat might get a look in. It will also be interesting to see what is offered out of Ukraine and by other sellers on the Black Sea, and whether Russian offers are undercut. The wheat harvest in Russia is winding down, and production is likely to be up sharply on last year's drought-reduced crop, but they are said to have a much higher percentage of low grade wheat than normal this year. Dec 13 CBOT Wheat closed at $6.56, down 6 3/4 cents; Dec 13 KCBT Wheat closed at $7.22 1/4, down 7 cents; Dec 13 MGEX Wheat closed at $7.13 3/4, down 5 1/2 cents. 05/11/13 -- EU grains closed mixed, but mostly a little lower, with very little in the way of fireworks - we're probably going to have to wait until Friday for those. The session ended with Nov 13 London wheat down GBP0.90/tonne to GBP163.85/tonne, Nov 13 Paris wheat EUR2.50/tonne weaker at EUR202.00/tonne, Nov 13 Paris corn EUR1.25/tonne lower at EUR162.00/tonne and Feb 14 Paris rapeseed up EUR3.00/tonne at EUR376.00/tonne. Iran is seeking 300-400,000 MT of milling wheat of optional origin. They said that they expect to import 7.5 MMT of wheat this season, far more than the USDA's current estimate of 4.5 MMT. Jordan seeks 100 TMT of milling wheat and 100 TMT of feed barley, both of optional origin. Other than those the tender line-up is a bit thin on wheat. Ukraine said that it hopes to export a record 3.5 MMT of grains in November, beating the 3.42 MMT shipped last month. The impending record Ukraine corn harvest is now past two thirds done. The Russian stats office said Russia exported 11.177 MMT of grain between July – Nov 1st, up only a fairly modest 8.5% from a year ago. Russia’s Ag Ministry estimated full season grain exports at 18-20 MMT versus 15.69 MMT in 2012/13. US wheat futures were down sharply on ideas that export demand is waning, and that the recent rally has been overdone, especially given dollar strength in the past few days. More sideways and directionless trade might be likely ahead of Friday's WASDE report from the USDA. 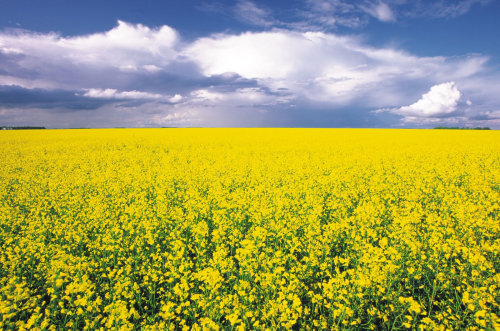 05/11/13 -- Rapemeal prices on the continent are easier for a second day running. 04/11/13 -- Soycomplex: Beans closed mostly firmer, with the exception of front month Nov 13 which ended a couple of cents easier and at the lowest levels for a front month since Feb 2012. Open interest in the Nov 13 contract stands at less than 9,000 contracts versus over 275k lots in the Jan 14 position. and still has another 10 days on the board yet before contract expiry. Decent rains in Brazil see planting progress there making good strides. Safras e Mercado said Brazil has now planted 44% of their 2013/14 soybean crop versus 26% a week ago, 42% a year ago and 36% on average. AgRural put plantings even higher at 48% done. Some of Argentina'a driest areas, the provinces of Córdoba, south and centre of Santa Fe and in the east of Entre Rios, got up to 200mm of rain over the weekend. The Buenos Aires Grains Exchange last week pegged soybean planting in Argentina at 4.6% complete versus 2.4% a week ago and 3.6% a year ago. Sunflower planting is 60.9% complete versus 46.6% a week ago and 54.5% a year ago. After the close the USDA said that the 2013 US soybean crop is 86% harvested, a little less than the 90% that the trade was expecting. Weekly export inspection posted another very strong week at 80.559 million bushels. The trade is now fully focused on Friday's upcoming WASDE report from the USDA. This one is particularly important as October's was shelved due to the partial government shut down. For soybeans the general feeling is one of better yields and higher production than we were given in September (41.2 bu/acre and a crop of 3.149 billion bushels respectively), but that should be tempered by increased domestic usage and higher exports. The upshot of that would be potentially little change to US carryout in 2013/14. South American production estimates could be scaled higher. Nov 13 Soybeans closed at $12.64, down 2 cents; Jan 14 Soybeans closed at $12.56 1/2, up 5 cents; Dec 13 Soybean Meal closed at $396.90, up $2.00; Dec 13 Soybean Oil closed at 41.25, down 34 points. Corn: The corn market continues to grind lower by a cent or two most days, from within a narrow daily trading range, and today was no exception. Tonight's close on the Dec 13 contract was the lowest for a front month since August 2010. This position has a hefty open interest of well over 650k contracts. The Deutsche Bank "roll" begins today and ends on Friday. They are expected to be rolling long Dec 2013 corn positions into Dec 2014. The Goldman Sachs roll is due to take place Nov 7-13, they will be rolling long Dec 13 corn positions into Mar 14. The Buenos Aires Grains Exchange said that Argentina's corn crop is 34.8% planted versus 26.8% a week ago and 40% a year ago. The heavy weekend rains there will be of benefit. South Korea bought 60 TMT of Black Sea origin corn for April shipment in a tender, having been a featured buyer of US corn last week. The USDA attaché in China estimated their 2013/14 corn crop at a record 210 MMT, with imports at 7 MMT. The USDA said that the 2013 US corn crop is 73% harvested versus the 75% that the trade was expecting. Even so, that's now better than the 5-year average pace of 71% at this time. Export inspections were big, and towards the top end of expectations, at 31.316 million bushels. Friday's USDA report is widely expected to show much better average US corn yields this year than the 155.3 bu/acre reported in September, with production potentially rising to 14 billion bushels, maybe even higher, versus 13.843 billion previously. There's a very wide range of production estimates for this report, as some analysts see the possibility that the USDA will cut harvested acres quite significantly even if they do put yields closer to 160 bu/acre. One survey has the range of production forecasts in the trade at 13.421-14.367 billion bushels, so not everyone is betting on a big increase in output in this report, some think it could actually drop. This makes the range of estimates for 2013/14 US ending stocks also pretty wide at 1.8-2.3 billion bushels. Corn production potential in South America for 2013/14 could also be trimmed. A bullish surprise from the USDA in corn could be explosive. The most recent Commitment of Traders report that we have shows non-Commercial and non-reportable combined traders sitting on a record short position in CBOT corn. Dec 13 Corn closed at $4.26 1/4, down 1 cent; Mar 14 Corn closed at $4.37, down 1/2 cent. Wheat: Wheat was lower on all three exchanges, unable to extricate itself from the gravitational pull of corn. A Saudi Arabian purchase of 720 TMT of hard wheat from multiple origins offered some support. The USDA attaché in China cut his estimate for wheat production there by 3 MMT to 118 MMT. Argentine rains are expected to have arrived to late to be of benefit to wheat there, harvesting has already begun in some parts. Bloomberg released their analysts estimates for Friday's report, suggesting that the market is looking for all-wheat ending stocks for 2013/14 to come in at 529 million bushels, down sharply from the September forecast of 561 million. This is likely due to the significant boost that US exports have received of late from their new best friend - Brazil. With Argentina's 2013/14 wheat crop likely to be little better than 10.5 MMT this year, their exports are highly unlikely to exceed 3 MMT, and may possibly be restricted to less than that. That could continue to see Brazil buying significant volumes of US wheat right through the current marketing year. Looking a little further ahead, US prospects for a large wheat crop in 2014/15 are very promising. 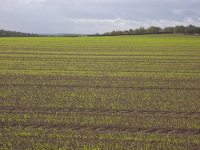 The USDA said that winter wheat plantings for next year's harvest are now 91% done, and that emergence is at 78%. The top wheat producing state of Kansas is 96% planted and 86% emerged - both are better than the 5-year average. Overall, the USDA sees 63% of the nation's winter wheat crop in good/excellent condition, up 2 points on last week and compared to only 39% a year ago. Weekly export inspections of only 7.146 million bushels were poor. Friday's USDA report is likely to be more about corn and soybeans than it is wheat, with the latter likely to follow the direction of corn. The Russian wheat harvest is wrapping up, but the quality of what is coming in isn't great. That will make them less aggressive sellers on the international stage going forward. Ukraine will soon start to concentrate on exporting corn, and the other cheap Black Sea/Eastern Europeans could soon be sold out on wheat. That should provide a nice window of opportunity for France/Germany, along with the US, Canada and Australia. Dec 13 CBOT Wheat closed at $6.62 3/4, down 5 cents; Dec 13 KCBT Wheat closed at $7.29 1/4, down 4 1/4 cents; Dec 13 MGEX Wheat closed at $7.19 1/4, down 6 1/4 cents. 04/11/13 -- EU grains closed mixed once more with Nov 13 London wheat ending GBP0.25/tonne firmer at GBP164.75/tonne, whilst Jan 14 was down GBP0.50/tonne also at GBP164.75/tonne. Nov 13 Paris milling wheat settled EUR3.25/tonne easier to close at EUR204.50/tonne. Nov 13 Paris rapeseed fell EUR3.00/tonne to EUR373.00tonne, whilst about to expire Nov 13 Paris corn closed unchanged at EUR163.25/tonne. The latter had a particularly choppy day, trading down to EUR159.25/tonne at one stage, the lowest level for a front month since June 2010. The rest of the market remains generally in "no man's land" where it has largely been for the past fortnight awaiting this Friday's USDA WASDE report. Two weeks ago London wheat was EUR165.50/tonne, and Paris wheat EUR204.75/tonne, so as you can see there's been very little change overall since then. The Kazakh grain harvest is now 98.2% complete at 20.6 MMT in bunker weight. A clean weight harvest of 18.5-19.0 MMT is expected by the local Ag Ministry, versus one of only 12.8 MMT a year ago. The Russian grain harvest is 92.7% done at 91.2 MMT. Wheat accounts for 53.7 MMT of that, along with 15.8 MMT of barley and 6.9 MMT of corn. Ukraine meanwhile has harvested 89% of it's 2013 grain crop, producing 52.32 MMT so far versus 41.39 MMT a year ago at this time. The corn harvest is two thirds done at 19.96 MMT - on track for record production this year. Ukraine has exported 9.65 MMT of grains so far this year (to Nov 1), up 12.4% on a year ago. Wheat accounts for 5.4 MMT of that along with 1.8 MMT of barley and 2.4 MMT of corn. APK Inform said that Ukraine exported 12.7 MMT of corn in 2012/13, down 16.4% on shipments of 15.2 MMT in the previous season. The EU took over half of their 2012/13 exports. Tunisia bought 92 TMT of soft wheat and 50 TMT of barley in a tender. Saudi Arabia reportedly bought 720 TMT of EU/US/South American/Australian hard wheat for Jan/Mar shipment in a tender. Otherwise the tender line up is pretty thin. The large disparity between corn and wheat values, on both sides of the Atlantic, remains an upside limiting factor for wheat. 04/11/13 -- Rapemeal prices on the continent are lower today, following some pretty steep declines in Chicago soymeal values on Friday night.